Ford Motor Co. says it has used a federal grant to develop a first-of-its-kind stamping technology that will allow it to create low-volume auto parts at essentially no cost. 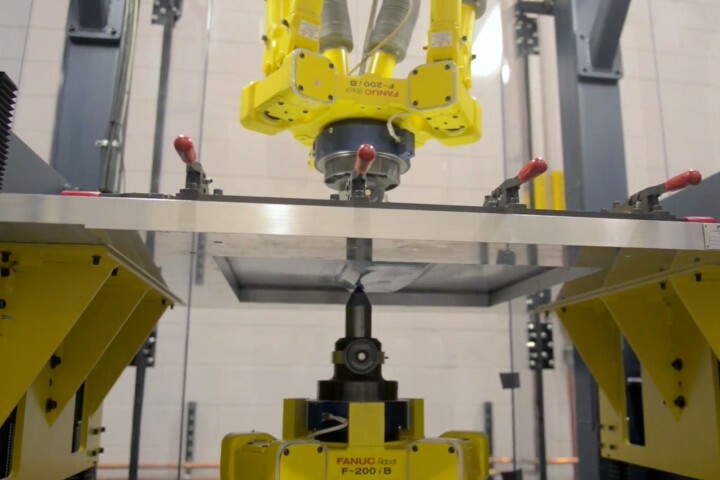 Dubbed Ford Freeform Fabrication Technology, the process — created at the automaker’s Research and Innovation Center — could soon allow consumers to customize bodywork on new vehicles, all while eliminating the high cost and wait that comes with engineering a stamping die. “As we forge ahead with cutting-edge technologies in manufacturing like flexible body shops, robotics, 3D printing, virtual reality and others, we want to push the envelope with new innovations like (Ford Freeform Fabrication Technology) to make ourselves more efficient and build even better products,” said John Fleming, executive vice president, global manufacturing and labor affairs, in a statement. Ford’s process works like this: A piece of sheet metal is clamped on its edges and formed into a three-dimensional shape by two tools that look similar to a stylus that are set up tip-to-tip on either side of the metal. The process can shape the metal so that it meets strength tolerances and surface finish requirements. The Dearborn automaker says the new technology could deliver a steel metal auto part within three business days; with current technology, parts can take two to six months to deliver. anyone else thinking Bespoke Program? Remember how America doesn't innovate anymore? Hey Suzie, say hi to Bob for me! This will eventually be offered in the tech shop facility, where members can use and train on any and all machinery. Ford is using the latest 3D-printing technology to give itself an edge in motorsports. The company has been using numerous 3D-printing laboratories to quickly create prototype parts for its street cars, ranging from buttons to knobs and intakes to engine covers. But it’s not just rapid prototyping with 3D-printed parts that is benefiting the American automaker’s production models, the company is using it on its race cars as well. In fact, Ford won the 2015 24 Hours of Daytona with a 3D-printed intake manifold with carbon-fiber plenums on its race car. This weekend, a Ford EcoBoost-powered race car will hit the track at the Belle Isle Grand Prix and it’ll be using 3D-printed parts, much like the intake manifold used on the Daytona Prototype. According to Ford, computer-aided design mockups are sent to the company’s rapid prototype lab, where they are analyzed and input into one of many 3D printers. In around one week’s time, Ford has a finished product that is ready to be cleaned, painted and used. For the rest of this story, Ford’s New Race Car Powered by 3D-Printed Parts please visit AutoGuide.com. Ford is trying its hand at a new way of manufacturing inexpensive and lightweight car parts: 3D printing. While 3D printing has existed in the auto manufacturing scene for quite some time, it was largely used for prototypes and molds, not the actual product. Ford is now looking to use the technology to produce a variety of customizable and low-volume parts. Manufacturers have used this technology, in some capacity, for years. Local Motors designed and made the Strati, the first 3D printed electric car, and racing teams have used it for specialty parts. Frank Stephenson, design chief at McLaren, told Forbes that the company’s product development period has shrunk from 36 months to 18 months, all thanks to 3D printing. Manufacturers’ use of 3D printing used to be limited by the size of the parts able to be produced. In the case of the Blue Oval, that issue no longer exists. Ford is using the massive Stratasys Infinite Build 3D printer to make parts that take up more than a little desk space. Large parts, such as a spoiler or long interior panel, is no problem for this room-sized mammoth. For now, the destination for these parts remain low-volume performance cars and customizable options ordered by buyers. However, Ford’s Technical Leader for Additive Manufacturing Research, Ellen Lee, said in a media release that the new technology will eventually translate into large-scale 3D printed auto manufacturing. Time for Ford’s** Carbon Fiber Subframe? There’ll be calculators working overtime as Ford engineers and bean counters figure out whether the lightweight, parts-saving component has a place in the brand’s stable. Magna first revealed its plans for the co-developed subframe in March 2017. While this isn’t the first time Ford tapped the supplier’s carbon fiber expertise, there’s a vast mass and price difference between the grille opening reinforcement on a pricey model like the Shelby GT500 and a subframe bound for a conventional passenger car. The supplier’s prototype reduces subframe mass by 34 percent over its steel counterpart. Comprising two molded and four metal parts, the structure replaces 45 steel parts found in a typical Fusion subframe. Swikoski didn’t fully break down the economics of using the pricey material, though he implied Ford customers wouldn’t see a diamond-encrusted markup on the price of a new vehicle. Using Magna’s subframe would cut tooling costs by 30 to 40 percent, he said, and Magna sought to further reduce expense by using several materials in the composite. Crash testing could be a determining factor in whether the component gets the green light. “It’s not meant to be a primary crash absorber,” Swikoski said, adding that, as the subframe only absorbs 5 percent of a crash’s energy, Ford will rely on the subframe’s steel surroundings for cushioning. ** Ford pay$ for it, it's theirs, right?